In the past months, we have been playing around with numbers a lot to update and finalise the working budget for the competition. Our Budgeting Team of Regina, Karoline and Gwen, business and economics graduates working in the field have flipped every coin and completely recalculated every single item that might incur cost at the competition. The result is a very detailed working budget that provides the financial frame for us to finalise contracts with venues and suppliers. The new budget is based on a registration fee that is about 10% higher than initially planned. This has several reasons. On the one hand, the budget we provided to Zagreb EUDC Council had a negative result of about 10k, which we had believed we would be able to fill up with additional sponsorship. In fact, we have not been lucky enough to obtain this additional sponsorship and cannot rely on further major inflows from now on. As a result, we were required to either marginally raise the registration fee or abandon the plan to accommodate the participants in 4 star hotels in immediate proximity to the tournament venue . We recognise that more value for the participants can be provided if they are accommodated excellently during the entire week for a small hike in the fee. This factor makes up the majority of the change in the Reg Fee. On the other hand, we gained experience from Zagreb that we need to reserve more funds for tax purposes. Bureaucracy and tax cost is hard to estimate in advance, as the precise legal structure needs to be adapted to circumstances. Indeed much of my time in recent days went into legal research, because this issue is so complicated. Given that taxes made a substantial impact on the Amsterdam EUDC and Zagreb EUDC budgets, we decided to allocate a higher amount on likely tax spending. While these all these predicted cost could be off-set by saving money on food, we also learned that this would be the less preferable option: the extra cost participants might incur if they had to buy food for themselves one single time, is higher than the increase in the Reg Fee. But what happens with your Reg Fee? 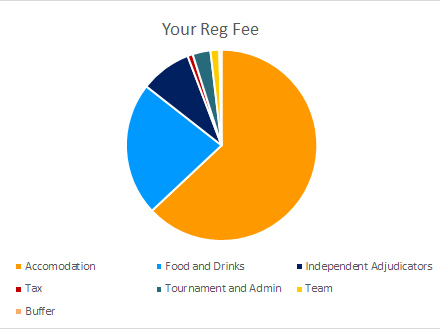 To give you a short overview what happens with your Reg fee, here is an approximate cost breakdown based on the latest budget update . In comparison with the budgets of previous EUDC, our cost structure is substantially different, mainly for the high amount of ‘implicit’ sponsorship we managed to obtain. Currently sponsorship adds more than 75 EUR in cash to your registration fee. Cash however, is only a fraction of the total amount of the sponsorship obtained for the tournament. At Vienna EUDC we have been very successful at reducing the cost of venues and supplies by cooperating with partners (‘implicit sponsorship’). We are unable to calculate the actual amount of savings, as one of the venues for Vienna EUDC is not bookable by the public. We estimate that the cost for this would have easily doubled your registration fee. Yet, implicit sponsorship does not reduce our need for cash income as much as cash sponsorship does. Even if we receive the venues free, we still need to cover the cost of transforming the place into a great social. Implicit sponsorship also fails to lower tournament expenses such as cost for independent adjudicators. About 90 EUR of your Reg Fee is used for the provision of food and about 245 EUR covers accommodation. This will ensure you enjoy the highest standards during your week in Vienna. The total cost for independent adjudicators at Vienna EUDC 2015 will make a sum of 20 000 EUR, i.e. 35 EUR per participant. Tab Team, CA Team and the entire administration in Vienna (printing, transport and logistics) amount to less than 17 EUR per participant. As mentioned above, taxation eats away about 3 EUR of your registration fee and this requires us to hold a larger buffer of about 2 EUR per participant. Lastly, subsistence for the team amounts to about 6 EUR per participant. This is something we had reserved for the best-case budget in our bid-booklet, which generally assumed worse accommodation. Numbers subject to change with surrounding conditions. 1 Pings/Trackbacks for "Where Does Your Reg Fee Flow?"